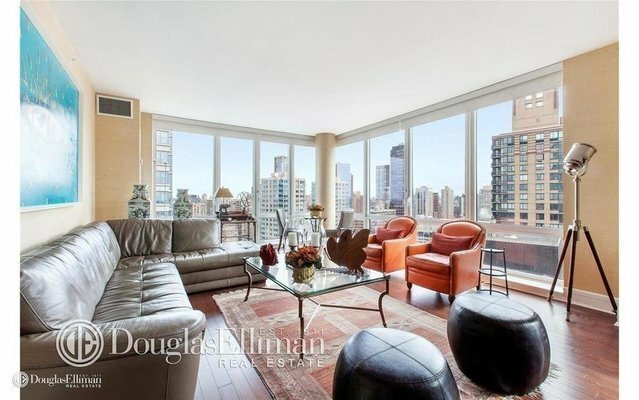 This fully furnished 3 bedroom, 3 bath residence boasts expansive New York City skyline and Hudson River views. Glass-walled great room with Brazilian cherry floors optimizes the light and views. The open kitchen features warm teak cabinetry with Blizzard Quartzite countertops with Caldia Marble chef block, integrated dish racks and paneled premium appliances from Smeg and Miele. Teak-wrapped master bath features Zuma deep soaking tub and separate glass shower, Bianco Dolomite marble double vanity and floors. THE ALDYN sports over 40,000 square feet of amenities including LA PALESTRA Athletic Club and Spa, a KIDVILLE playground, 75' indoor pool, basketball / squash court, 38' rock climbing wall, bowling alley, yoga, pilates, a club lounge, on-site parking and more.